Updated Thursday July 30, 2015 by Saskatoon Minor Basketball. Officials Registration Opens August 1st! 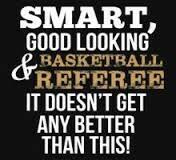 We are always looking for motivated and strong people who are willing to referee our SMBA league games. If you think you have what it takes to become an SMBA official please register with us. We offer training and always have Supervisors on hand for extra guidance. You must be in Grade 9 or higher to be an Official. If you are a new official or a a veteran official please register online. The link is on the left hand side of the League Home page underneath the menu. If you have any questions please email Ian Mirtle at smba@sasktel.net or call him at 306-382-5508. Please make sure you are on the League Home page or you will not see the registration link underneath the menu (the League Home tab is under the SMBA logo on the top of the left hand side of the page).